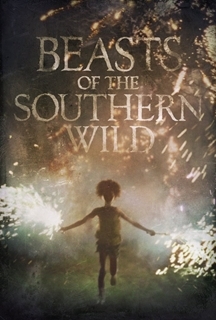 In the opening sequence of Beinh Zeitlin’s Beasts of the Southern Wild, a wildly imaginative independent film set on the Louisiana Gulf Coast, a herd of Ozarks, towering beasts that roamed the earth in the days before the Ice Age, thunder across the screen. These animals have significance to the main character, a young girl named Hushpuppy, wonderfully played by newcomer and Louisiana native Quvenzhane Wallis. Hushpuppy was raised by her father in the Bathtub, a fictional place that, nevertheless, many South Louisianans swear to God resembles communities that actually exist. These are places that barely resemble an America in any traditional sense. There is Zydeco fiddle music, crawdads and Cajun Country accents, but there is little in the way of recognizable civilization. There are no hospitals, no schools, and no churches. Only a band of survivalist ruffians surviving off the fruit of the earth, who consider themselves a part of the earth, one with the water, the swamps, even the storms. Hushpuppy’s father, a wonderfully ferocious Dwight Henry, catches fish with his bare hands, builds motorboats from the converted flatbed of a pickup truck, and maniacally defends his people from the encroachment of modernity and the wiles of Mother Nature, if not the inescapable dangers of everyday life. He and his daughter ride out Hurricane Katrina in their rickety raised shack, together with their chickens and pigs and dogs, which Hushpuppy will readily cook and eat should it prove necessary. When her father tells her, after the flood, when their land lies deep underwater, he is going to “Fix everything the way it was,” we the audience actually believe him. His scheme is to bomb the levee that protects New Orleans, yet dooms all those outside its protection. Indeed, the water recedes, but the damage is already done. The Bathtub has been destroyed, and the outside world is about to take notice. Death plays an important role in this film, on scales grand and personal. More than anything, this film celebrates Southern individualism, and the astounding culture of self-reliance in bayou country Louisiana, a culture that has always been at risk by its very spectacular nature, an island of cultural distinction in a sea of American mediocrity. An old New Orleans joke has an anonymous tourist asking a local how far it is to Baton Rouge; the answer: 100 years. Theirs is a self-perpetuating culture that is not overly approving of outsiders, fiercely proud of their own way of doing things, and generally indifferent to traditional “progress” in deference to the preservation of their music, food and social mores. Unsurprisingly, critics there have received Southern Beasts with, er, wild enthusiasm. The narrator, Hushpuppy, has a very active imagination. Her mother left she and her father when their child was only an infant, yet, when at her loneliest, Hushpuppy imagines conversations with her. And the Ozarks, too, figure powerfully in her young mind, these mighty wild beasts who some Bathtub residents come to closely resemble when doing battle with local authorities and breaking from the hospitals: “Here, when an animal gets sick, they plug it into the wall,” Hushpuppy thinks. “Daddy told me, when he gets sick, I should put him in the boat, and set him on fire, so that they don’t plug him into the wall.” Indeed, as he refuses medical treatment, and a wound on his shoulder becomes infected, there are more than a few moments of tear-jerking grandeur, as we see in her father’s death the inevitable demise of this spectacular culture, the scattering of its people to the winds and into society, where, one imagines, they would stand out just about as starkly as would the mighty Ozarks. This post originally appeared on SevenPonds.com, and cannot be reproduced without permission.